* Is it possible to use ReShade 2.0 without using the ReShade Assistant? 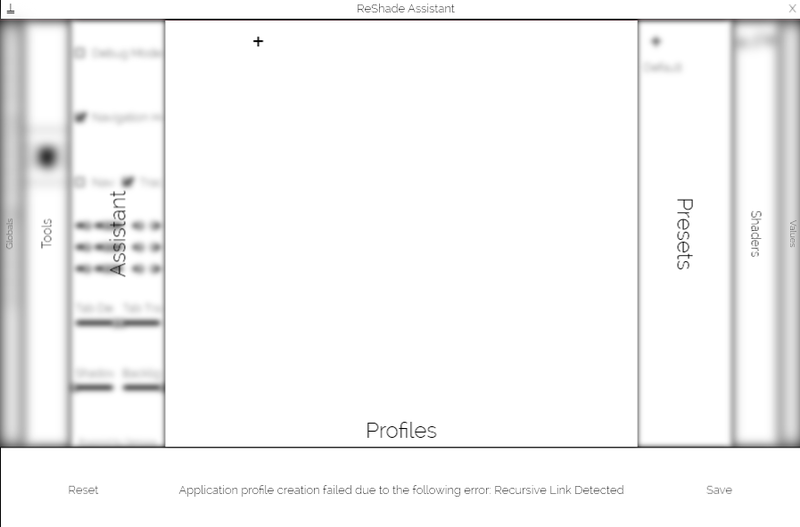 You cannot create a profile with a symlink when it points to itself. The Assistant is supposed to be used in dedicated location and manage all profiles from there. If you do not want to use the Assistant, you can drop the files in your applications's binary folder and adjust the configuration in the /ReShade/Presets/Default/ folder. The Global.cfg for this case can be found in /ReShade/Profiles/Default/ and will be pointed at by ReShade if no profile for the running application exists. All GitHub managed shader have been included. If the shader is not included, it might be due to it not yet being included there. Its highly recommended to use the ReShade Assistant, since it can prevent a lot of mistakes from happening and provides some additional features for preset generation such as the offline preview or LUT generation from a created configuration. Thank you, its solved now, only those (missing) shaders arent in the Ioxa shader folder in ReShade 2.0, perhaps loxa will update the shaderpack for ReShade 2.0 via reshade.me/forum/shader-presentation/529...contrast-enhancement (latest was ioFX v1.2 for ReShade + Framework).